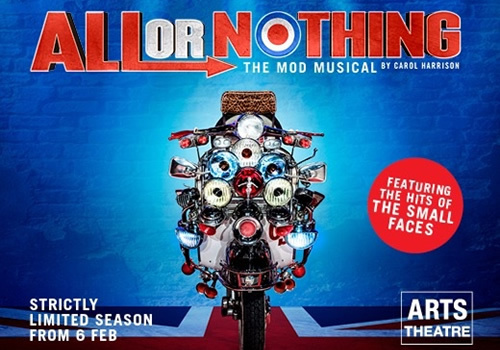 After a sensational UK tour, the smash-hit All or Nothing – The Mod Musical scoots into London for a limited West End run. Based on the rise and demise of rock band Small Faces, this stunning new musical encapsulates everything it is to be “mod”. Featuring the hit music of the band, the production has stopped at the UK’s top theatres before crashing into the Arts Theatre. All or Nothing is the rockin’ show that tells the story of four young East London kids who form a band in order to make it big. Shooting to fame, Small Faces become the face of mod, a 1965 phenomenon that established a unique blend of taste, cool style and a love for rhythm and blues. However, when the novelty of fame wears off, their lives become swamped in jealousy and betrayal. A home-grown musical, written and directed by award-winning actress Carol Harrison, All or Nothing features an incredible score from Small Faces’ back catalogue, including “Whatcha Gonna Do About It”, “Tin Soldier”, “Lazy Sunday”, “Itchycoo Park” and many, many more. Carol Harrison stars as Kay Marriot, opposite Chris Simmons as Steve Marriot. Harrison is best-known for her roles in EastEnders, Brushstrokes and Casualty, while Simmons is known for starring in The Bill. Additional casting includes Samuel Pope as Young Steve Marriot, Stefan Edwards as Kenney Jones, Stanton Wright as Ronnie Lane, Alexander Gold as Ian McLagan, Edward Elgood as Jimmy Winston, Karis Anderson as P. P. Arnold and Russell Floyd as Don Arden, as well as Daniel Beales, Alfie Harrison-Foreman, Dani Acors and Emily Daniels. Having played to packed-out audiences across the UK, All or Nothing – The Mod Musical arrives in London to play on home soil. Running at the Arts Theatre, the production plays from February 8th to March 11th 2018, with previews beginning February 6th 2018. All or Nothing – The Mod Musical is recommended for those aged 14 and up.